Anders Thomsen and Simon Lambert on the charge for Panthers against Scunthorpe. Photo: David Lowndes. Peterborough Panthers have seen their Premier League play-off challenge descend into controversy before it has even begun. The city team powered past struggling Scunthorpe 54-36 in their final meeting of the regular season at the East of England Showground yesterday (September 13). Recent signing Ben Barker spearheaded a fine display with a paid maximum and fellow recent arrival Anders Thomsen also impressed with a double-figures return of his own. Their efforts inspired a success which clinched fourth position in the final standings and turned an almost inevitable play-off quarter-final clash against Sheffield into a reality. Their opponents have already announced the first leg of that tie will take place at their Owlerton base on Thursday (September 17), but Panthers chiefs stress they have not agreed and will not agree to race on that date. They face being without three riders - Barker, Thomsen and Emil Grondal - due to overseas commitments in addition to captain Ulrich Ostergaard, who recently won the Premier League Riders’ Championship at the track, being ruled out for the rest of the season due to injury. Joint team boss Carl Johnson said: “We have made our position known regarding the staging of the first leg and we hope there will be further developments in the early part of this week. “We have three riders away due to other meetings on the continent and we do not feel we should be forced to ride without our best team. “We have worked so hard for six months to get into this position and we do not want that to go to waste due to having to race without important riders. “We have had enough bad luck this season through injuries without having anything else to deal with. “I can’t see why there is such a rush to stage the meeting so soon after we have finished our league campaign anyway. Panthers will at least go into the end-of-season honours battle with confidence and momentum after putting Scunthorpe to the sword yesterday. They provided 11 race-winners and racked up eight heat advantages during an impressive display headlined by their two most recent captures. Barker followed in Grondal for a maximum in heat four before charging to victory in his remaining four races – typically by swooping around the outside on the opening lap. 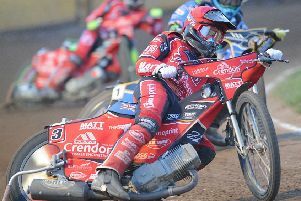 And World Under 21 title hopeful Thomsen claimed three victories of his own to amass a second double-figures return in only three meetings for the club. Club bosses’ hunch that he would prove to be on a false average are proving accurate. Barker and Thomsen combined to bring the curtain down on the regular season with a bang courtesy of a heat 15 5-1. The former missed all the drama in behind as Thomsen twice had to battle past high-scoring Scunthorpe reserve Alex Davies. He was not at all impressed with the forceful riding of his rival either and the two men exchanged barges and pleasantries on the cool-down lap. Guest number one Rohan Tungate did his prospects of further Panthers outings in the play-offs no harm with a couple of victories in his nine-point haul while Grondal was paid for the same tally after managing two wins of his own from reserve. The bulk of the visitors’ points were scored by their reserves as Davies – the son of early 1990s Panthers rider Stephen - and Nike Lunna contributed 20 between them. Guest David Bellego – a Sheffield rider - also made the most of some valuable Alwalton laps ahead of the play-offs with a 10-point haul, but another man borrowed from the Tigers, Andre Compton, fared nowhere near as well with 5+1 from five rides. Johnson added: “We wanted to put in a good home performance to set ourselves up for the play-offs and we did that. “Ben and Anders showed why we brought them into the team and their arrivals have really given us a boost. PANTHERS: Ben Barker 14+1 (paid max), Anders Thomsen 13+1, Rohan Tungate (guest) 9, Emil Grondal 8+1, Simon Lambert 5+2, Michael Palm Toft 5+1, Rafal Konopka 0. SCUNTHORPE: Alex Davies 12+1, David Bellego (guest) 10, Nike Lunna 8+2, Andre Compton (guest) 5+1, Carl Wilkinson 1, Leigh Lanham 0, Rider replacement for Zdenek Holub.